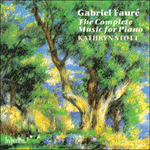 The work in question, the Impromptu, Op 86, must have placed great demands on the composer’s already limited time (Fauré was in addition to his work as a composer, director of the conservatoire and organist at the Church of the Madeleine), and Kahn was later to recall the composer coming into the harp class with the work’s ending, which the hapless students had to furiously copy out by hand. This has led some commentators to doubt the authorship of the piece, attributing large sections of the work to Fauré’s friend Alphonse Hasselmans (1845–1912), a composer and professor of harp at the conservatoire. Yet this has not been conclusively proven, and whatever the doubts, the Impromptu creates an effect of pleasing magnificence. Broad, luscious chords give way to lyrical falling motives which are then developed in a series of virtuosic variations, making use of harmonics, glissandi, cross fingerings and rich arpeggios.